Project SNOWstorm was created in the winter of 2013-14 to study the largest invasion of snowy owls in the East in nearly a century. Project SNOWstorm is a unique collaboration of more than 40 scientists, bird-banders and wildlife health professionals, all working as volunteers. This winter, with a second major irruption taking shape (especially in the Midwest), our team is expanding its research into this beautiful and mysterious raptor, using state-of-the-art telemetry, banding, DNA and isotope analysis, toxicology screening and more -- all funded by the public. With cutting-edge tracking technology, we can follow the movements of snowy owls in astounding detail, and potentially for years at a time. But we need your help to quickly raise funds to purchase additional transmitters.Collaborating scientists in Project SNOWstorm are tagging owls throughout the Northeast and Great Lakes with new GPS-GSM transmitters made by Cellular Tracking Technologies of Somerset, PA. These solar-powered transmitters record locations in three dimensions (latitude, longitude and altitude) at programmable intervals as short as every 30 seconds, providing unmatched detail on the movements of these birds, 24 hours a day. Unlike conventional transmitters, which report their data via Argos satellites in orbit, GSM transmitters use the cellular phone network. When the bird is out of range of a cell tower, the transmitters can store up to 100,000 locations, then transmit that information — even years later — when the bird flies within cell coverage. The transmitters weigh about 40 grams — about as much as seven U.S. quarters, and only 1.5-3 percent of the bird’s weight. They are attached with a backpack harness made of low-friction Teflon ribbon that goes over the bird’s wings. Studies of snowy owls wearing conventional satellite transmitters in this fashion have found no evidence that they increase mortality or decrease breeding success (Therrien et al. 2012). Still, we’re careful only to tag snowy owls that are in robust health. As experienced researchers, we assess every owl we catch to make sure it is in good shape, with normal weight and healthy fat stores. Any owl that seems questionable will not be tagged. Black Swamp Bird Observatory teamed up with USDA Wildlife Services, Kirtland Bird Club, and Project SNOWstorm to radio-tag a Snowy Owl! 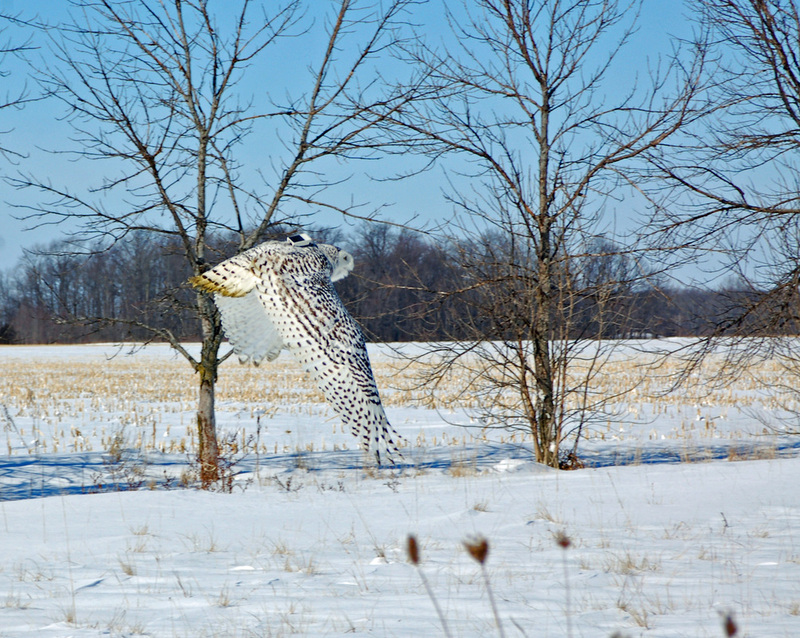 We named her "Buckeye," and she's the first Snowy Owl to be radio-tagged in Ohio! This is the second year for Project SNOWstorm, and we followed their well-designed protocol that ensures bird (and handler) safety. It's an honor to be part of this important study, and a joy to be part of this bird's life. The photo captions tell more of Buckeye's story, and once she's been added, you can track her progress at the Project SNOWstorm Website. We are deeply grateful to Kirtland Bird Club for helping to fund the cost of the transmitter, and to USDA's Brian Washburn for his major support and hands-on assistance in trapping and tagging Buckeye! Buckeye was originally trapped in mid-January at the Detroit airport. For her safety, and the safety of passengers traveling into and out of the airport, she was transported more than 80 miles away. Unfortunately, last Friday she came back. She was trapped again, and transported to BSBO where she was radio-tagged by the team of Brian Washburn, USDA Wildlife Services, and Mark Shieldcastle, BSBO's Research Director. Here, you can see the thin but strong harness used to attached the radio transmitter. Once in position, the straps of the harness are moved beneath the feathers and up against the skin so that it doesn't impede flight in any way. The transmitters are designed to stay on the bird for the rest of its life. The harness is made of low-friction Teflon® tape, a design that’s been used for decades on many birds of prey, including large owls. Similar harnesses have been used with satellite transmitters on snowy owls, with no effect on the owls’ survival or breeding success. TRACK BUCKEYE'S PROGRESS AT THE PROJECT SNOWSTORM WEBSITE HERE! Here's a short but exciting video of the moment Buckeye is returned to the wild! With the tagging process complete, Buckeye was transported to an open area of Ottawa County for release. With the carrier opened, it's all up to her now. You can see the transmitter in this photo. It obviously does not impede flight in any way.